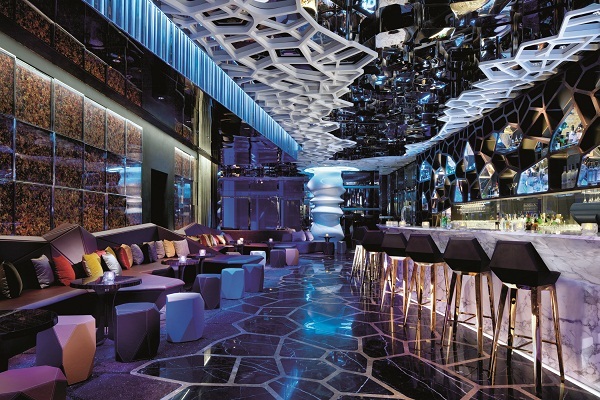 Unless you’ve been reading censored news, you’ve probably heard about Ritz Carlton’s return to Hong Kong, and the crowning glory of the hotel is Ozone, the highest (and quite possibly one of the most stylish) bars in the world. The Ritz-Carlton Hotel Company has been pretty busy of late. After the 2008 closure of their elegant property in Central the group went silent for a while both here in the city and the region, but now they have returned with a palpable bang, as The Ritz Carlton Hong Kong and their latest properties have shown. Recently the brand has changed their positioning in the market slightly and a slight shift in their design philosophy and service evolution has emerged across their stunning portfolio (particularly in the newer properties). 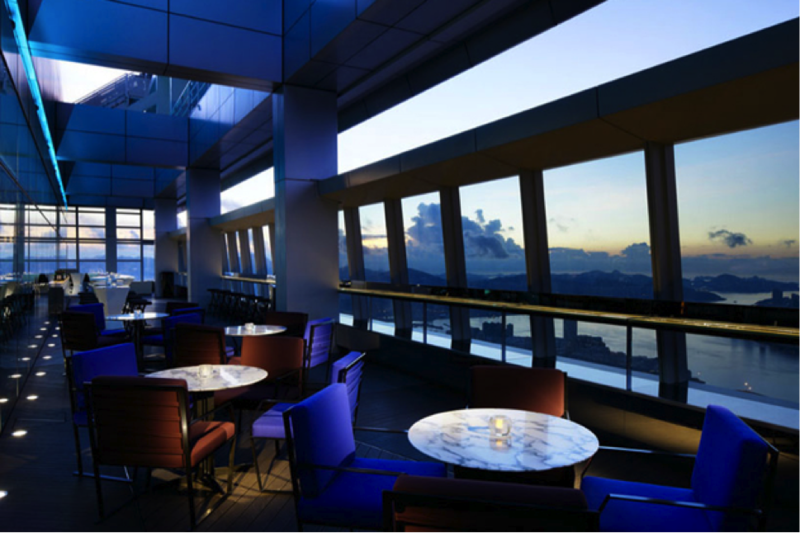 Up on the top floor of The Ritz Carlton Hong Kong, Ozone is a testament to this fact, with the bar and light eatery boasting top-notch service and a conspicuously eye-goggling design scheme. While the ICC is sadly not the highest building in the world, Ozone is, vertically speaking, the highest bar in the world – period. This alone is reason enough to visit the 118th floor venue, but thankfully this is not the only incentive, with the stunning views complemented by top-quality drinks and food, fine service, plus a stunning interior. The interior design was overseen by Masamichi Katayama and his self-owned company Wonderwall Inc., a design company with a difference that has an incredible catalog of exclusive interiors which includes impressive store spaces designed for Bape, Uniqlo and I.T, plus a Tokyo restaurant interior for Harrods, a Parisian restaurant called Collette and more. Although Wonderwall Inc. is anything but typical, their typical atypical design style can be seen all over Ozone, with playful contemporary plastic features appearing alongside first-rate materials and creative atmosphere-building gilding. There is a distinct Alice-in-Wonderland vibe about the whole interior, which was created around the theme of an ‘Edenic Experiment’ – “a man-made environment of nature in an imaginary world,” as the designer overview states. In other words, blown-up inspirations of nature can be seen everywhere, from the dim neon color-changing forest-like entrance through to the beehive-resembling ceilings and marble-shaped bamboo. After being zoomed up to Ozone in an elevator which reaches ear-popping speeds of nine meters per second, one is greeted by an atmospheric entrance area, where layered mirror ceilings, curtain-shaped walls and rock-resembling floor patterns tease and tantalize one’s expectations before entry. Once inside one is greeted by an eccentric white pillar which resembles oversized stacked marshmallows and acts as a visual centerpiece. Further in the interchanging neon colors continue to shine out along the ceiling, where they are complemented by beehive-like ceilings, geometric shapes and flower petal patterns on the walls below. The beehive shapes run behind the bar as well where they take on a web-like appearance. Along from the main bar is a sushi bar, and things get taken down a notch here, where a whitewashed marble counter is matched by marble bamboo-shaped pillars behind. In the main dining area the hive ceiling continues, but globular bubble light fittings add a different touch here. Outside, in the semi-al fresco area where 12-foot walls of glass offer panoramas of the city, there is another bar, and this one takes on an iceberg appearance. Various bar tables correspond with the white ice theme while a few rattan seats and bar stools provide a nice place to admire the view from. Of course all this perfection would not be complete without a good selection of food and drink, and luckily, Ozone does not disappoint in this area either. Covered with custom-made holograms, the menus contain wonders such as wines that hover around the $100’000 mark, custom-made cocktails and signature drinks, plus a fine selection of sushi, sashimi, tapas, tempura and caviar. love this post! the skyline must be breath taking as you kiss the ozone layer!. what an amazing experience!! thanks so muc! i will watch the video and live vicariously through your posts!!peace! loved your video ! !it was so beautiful and it truly captured the city. your composition of shots was perfect and makes me want to go there someday to see it myself. i will definitely pass your video unto my friends! !